A visit to the Grampian Transport Museum Alford is like taking a step back in time whilst celebrating the advancement of technology and engineering. Whether your passion is motorbikes, old cars, bicycles or public transport - there is something of interest for everyone here. A tour round the Grampian Transport Museum Alford is a great education for the youngsters whilst being a trip down memory lane for the older visitor. Do allow about an hour to tour the museum. There is disabled access, though some exhibits are accessed via stairs, which have no access for the disabled. Vehicles of interest at Grampian Transport Museum Alford include the beautifully restored Cruden Bay Hotel tram car, the Craigievar Express steam tricycle and an original Raleigh Chopper. Some of the exhibits can be climbed aboard, such as the tram cars, the 1970's bus and the traction engine. A particular treat is being able to hop onto a Penny Farthing. Not to worry about getting your legs up - a step ladder is provided! There is also a Mini that has never been started, a motorbike that is the last of its kind and a newly refurbished Halley Lorry from 1911 that has been getting a make-over in our workshop and is now ready for its big debut. With an original Gypsy Caravan from 1915 and a car that used to be used to drive the Queen Mother around, there is something for everyone this season. Refreshments can be purchased in the tearooms at Grampian Transport Museum Alford and there is a large outside picnic area next to the children's play area. From Aberdeen, take the A944 and head towards Alford. The right turning you need will be sign posted. If you intend to visit the Alford Valley Railway read our review about the railway. From here, you can take a trip on the oldest Sentinel steam wagon that was built in 1914. It will take you to the museum and take you back after your museum visit. Children are allowed to honk the horn throughout the trip! Upon arrival at the museum they can then ring the steam roller bell! Whichever place you visit first, each has ample parking and public toilets. The opening times of the Grampian Transport Museum are daily from 1 April to 30 September 10am � 5pm and from 1 October to 23 October 10am � 4pm. �See More in Store� first Wednesday of each month. Sunday 3 April, 1-4pm - Mothering Sunday: Vintage car and horse carriage rides; Victorian storytelling and a free pot of tea for mum in the Traveller�s Rest Tea Room! Sunday 8 May, noon - 4:30pm - Go for a Spin! Vehicle Rides & Family Fun: Ride in and on an exciting variety of vintage and modern vehicles on our road circuit and local roads; buses to supercars, fire engines to snow ploughs! Other activities will include magic, quizzes, competitions and more indoors and out. Sunday 5 June, 11am-5pm - Alford SpeedFest: Bringing together a selection 100 post-1955 classic, sports, performance and competition cars � this will be an action packed day. The arena programme will feature first class acts, auto-tests, demos and pursuits putting some truly historic performance and supercars through their paces. Sunday 24 July, noon-4.30pm - Classic & Vintage Gathering: A traditional afternoon gathering of classic and vintage cars, commercials and motorcycles pre-1990. Saturday 2 to Thursday 7 July - Sci-Fi Convention: Sci-Fi visiting displays, demos and characters. The return of the Daleks!! Wednesday 10 August, 12.30-4pm - Family Fun Day: Return of the popular activity afternoon including rides, magic, storytelling, craft making � indoors and out! Saturday 20 August, 3pm�8pm - Arena concert: Ticket available in advance only. Line up to be confirmed. Sunday 4 September, 11am-5pm - Grampian Motorcycle Convention in Association with the Bon Accord Motorcycle Club The North�s Premier Motorcycle Event! Vintage, classic and modern bike parades, classic racer demonstrations, trade shows, arena trials, super motos and the famous Scottish Championship Moped Marathon! Sunday 2 October, 9am-3pm - Autumn Autojumble: One of Scotland�s largest autojumbles. Over 60 stalls selling everything associated with land travel and transport from small parts to complete vehicles. The following text refers to past events at the Alford Transport Museum and are included for historic interest. Each year the GTM holds a Grampian Motorcycle Convention which is a meeting place for North east bikers and a great day out for the family. 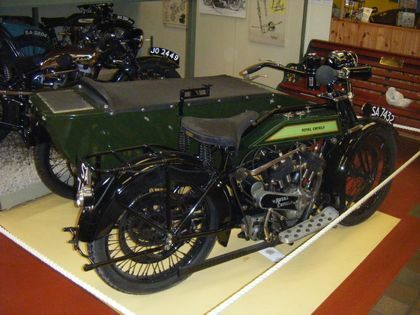 The Grampian Motorcycle Convention at the Grampian Transport Museum also includes classic racing bike displays, the final of the Scottish Moped Marathon and road circuit displays. In 2007 the 25th Grampian Motorcycle Convention was held on Sunday 9 September from 11am until 5pm. It included stunt motorcycle demonstrations from bike stunt riders such as James Laing from Troon, Robbie Stewart, Tim Hastings, sidecar racers Bill Annandale and Alistair Lewis and former world bike stunt champion Kevin Carmichael. 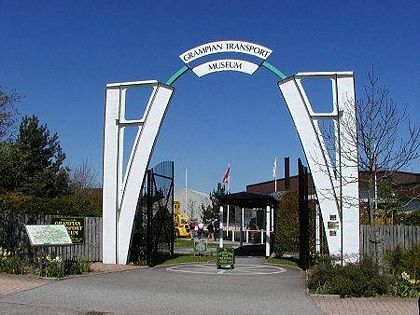 If you have a photo of the Grampian Transport Museum that I may use on this page then please contact me. In 2007 the Grampian Transport Museum in Alford celebrated its silver jubilee. As part of the celebrations there were new cars and displays. These included a Jaguar 240 saloon, a 140mph 1949 Norton Inter, a 1913 Perry Light and a 1963 Morris Traveller. The Royal Scots Dragoon Guards Museum lent a Scorpion Tank to Grampian Transport Museum that usually resides at Edinburgh Castle. It sat at the entrance to the Grampian Transport Museum. An original Silver Ghost Rolls Royce car, one of the world's most valuable cars, will be on display during the silver jubilee of the Grampian Transport Museum Alford. The Silver Ghost Rolls Royce car is so valuable it has been insured for �20 million. It is over 100 years old and the registration number plate is AX 201. Mike Ward, the curator at Grampian Transport Museum Alford, contacted the current owners of the Silver Ghost Rolls Royce car who are Bentley Motors to seek permission to display the unique vehicle during the silver jubilee celebrations around the annual celebration date of 22 July 2007. As part of the Rolls_Royce centenary the Silver Ghost car made a 17 day, 2000 mile tour of Scotland in honour of when the Silver Ghost won the Scottish reliability tour in the year 1907. Since then all Rolls_Royce car names began with the name Silver. Sixty cars will take part in the Scottish tour which includes Rolls Royces from as far as Singapore, India and New Zealand. The Silver Ghost was so named not just because of its Silver appearance and colour but also because at the time it had extraordinary stealthiness. The Scottish reliability trial was a test drive in 1907 and was re-enacted in 2007. The Aberdeenshire leg started on Monday 5 June 2007 at Ardoe House Hotel. 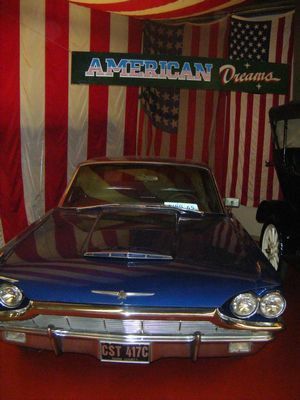 Over 60 vintage cars took place, some coming as far as Hong Kong and Australia. The event was organised by the 20 Ghost Club to mark the centenary if the Rolls-Royce Silver Ghost. Drivers will travel from Aberdeen, through Royal Deeside in Aberdeenshire and then onto Aviemore before heading down to Edinburgh for the final leg on the 13 June 2007. The original Rolls Royce Silver Ghost travelled over 15,000 miles in two months to demonstrate the power and reliability of the vehicle. A new exhibit for 2007 at Grampian Transport Museum Alford was the history of the postal services by the British Postal Museum. On display were mail coaches from the 1800s, a bantam motorbike, a Postbus, a 1938 Morris Minor and Morris 8 hybrid Mail Van. The exhibition was called Moving the Mail: From Horses to Horsepower. The first ever military vehicle tattoo will take place at Grampian Transport Museum on 26 August 2007. The 25th anniversary of the Motorvation saw the event being opened by the racing driver Ryan Sharp. Ryan is an FIA GT Aston Martin driver. Other events to mark the jubilee of the Motorvation was the Ken Fox Wall of Death where stunt drivers performed tricks on their classic Indian motorcycles. There was also a display of over 160 classic and vintage cars and vehicles which included a Lamborghini Diablo Roadster that belonged to Rod Stewart and motorcycle stunts performed by Steve Colley. On Sunday 26 August 2007 from 11am the Grampian Transport Museum in Alford held a Grampian Military Vehicle Tattoo featuring mechanised military vehicles throughout the years. This included military motorcycles, trucks and jeeps such as the Fox and Ferret armoured cars. Continuing the military theme there was the Golden Lions Freefall Parachute Display Team, demonstrations which included a 60 ton Centurion Heavy Recovery tank, military vehicle drive past, music from the pipes and drums of the Gordon Highlanders and an auction of military vehicles which included a 1946 Leyland Hippo and a Humber Pig from the 1960s. Other events at the Grampian Military Vehicle Tattoo included vehicle rides, entertainment from the Bon Accord Silver Band, displays, trade and food stands and a funfair. World War Two veterans were at the Grampian Military Vehicle Tattoo and wore military uniform. 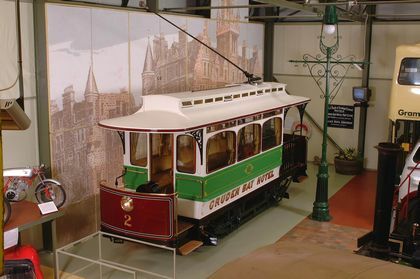 They were treated to free admission throughout the Grampian Transport Museum. History Grampian Transport Museum - The Grampian Transport Museum Alford was opened in June 1984. VIP guests included Gordon MP Malcolm Bruce, Transport Minister Lynda Chalker and the Chairman of the Museum Association James Gordon. They were driven by Jack Morrison from Stonehaven in an 1907 Rolls Royce.